A woman walks past the rubble in Kathmandu, Nepal, May 13, 2015, following a 7.3 magnitude earthquake that struck, May 12, 2015. A Nepalese woman carrying belongings walks past a damaged house after a new magnitude 7.3 earthquake in Chautara, Nepal, May 13, 2015. An Indian widow, center, is comforted by relatives and friends after the death of her husband on the outskirts of Patna on May 12, 2015, after a new 7.3 earthquake and several powerful aftershocks hit neighboring devastated Nepal. 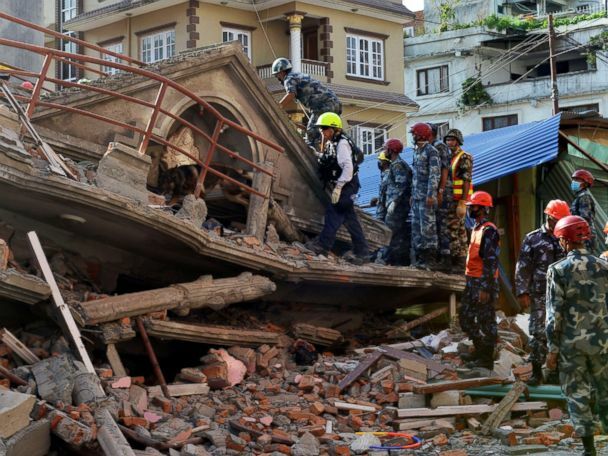 U.S. rescue team officials with a sniffer dog search for survivors at a collapsed house in Kathmandu on May 12, 2015, after an earthquake struck. Nepalese military personnel remove debris in search of survivors after an earthquake struck, in Kathmandu, Nepal, May 12, 2015. Local residents evacuate onto a street minutes after an earthquake in central Kathmandu, Nepal, May 12, 2015. Traffic comes to a halt after an earthquake hit Nepal in Kathmandu, Nepal, May 12, 2015. People run into the streets after a magnitude 7.3 earthquake hit Nepal as the country recovers from last month's devastating earthquake, in Kathmandu, Nepal, May 12, 2015. Nepalese people gather outdoors after another earthquake in Bhaktapur, Nepal, May 12, 2015. People run in the street after a magnitude 7.3 earthquake hit Nepal, in Kathmandu, Nepal, on May 12, 2015. A survivor is carried on a stretcher after being rescued by Nepalese policemen and U.S. rescue workers from a building that collapsed five days ago in Kathmandu, Nepal, April 30, 2015. Villagers wait in the rain as an aid relief helicopter lands at their remote mountain village of Gumda, near the epicenter of the massive earthquake that occurred on April 25, 2015, in the Gorkha District of Nepal, April 29, 2015. A 4-month-old baby was rescued from rubble in Nepal, April 26, 2015, following an earthquake. An Indian girl cries near the coffin of her mother Hema Prabha Saikia, a victim of Saturday's earthquake in Nepal, in Gauhati, India, April 29, 2015. Houses on the higher reaches of mountains destroyed in an earthquake on April 25, 2015 are seen from a helicopter near Dhadingbesti, in Nepal, April 29, 2015. The first aid shipments reached a hilly district near the epicenter of Nepal's earthquake, a U.N. food agency official said, and distribution of food and medicine would start five days after the quake struck. Bhoj Kumar Thappa, 30, stands on his collapsed home where his wife and unborn child were killed during a massive earthquake in Paslang village in the Gorkha District of Nepal on April 28, 2015. Nepalese victims of the earthquake sleep under their makeshift tents at Tunshikel park on April 28, 2015 in Kathmandu, Nepal. A young girl sits in a makeshift shelter in the destroyed village of Paslang near the epicenter of a massive earthquake in the Gorkha District of Nepal on April 28, 2015. A resident carries his belongings from the ruins of his home after Saturday's earthquake in Bhaktapur, Nepal, April 28, 2015. Search and rescue operations continue after a powerful earthquake in Bhaktapur, Nepal, April 28, 2015. People search through the rubble at Durbar Square in Kathmandu, Nepal, April 28, 2015. A victim with a broken leg from Saturday's massive earthquake, gives her details to Nepalese soldiers as she arrives by helicopter from the heavily-damaged Ranachour village at a landing zone in the town of Gorkha, Nepal, April 28, 2015. Residents take shelter at one of the temporary street shelters near Basantapur Durbar Square in Kathmandu, Nepal, April 28, 2015. Nepalese people wait for a bus in Kathmandu, Nepal, April 28, 2015. Sophia Lama, 7, of New York, makes sure a message of hope holds onto a wall after on a growing memorial after a deadly earthquake in Nepal, Monday, April 27, 2015, in the Jackson Heights, New York. Kevin Lama, 12, of New York, keeps candles lit at a growing memorial after a deadly earthquake in Nepal, April 27, 2015, in the Jackson Heights, New York. The 7.8 magnitude earthquake on Saturday caused massive devastation, with more than 2,500 people killed and thousands injured in Nepal. It brought down buildings and even a monument, and set off avalanches on Mount Everest. Workers load humanitarian aid from German Red Cross (DRK) for victims of the earthquake in Nepal, into an aircraft at Schoenefeld airport outside Berlin, April 27, 2015. A Nepalese family mourns during the cremation of their relative killed in the recent earthquake, at the Pashupatinath temple, on the banks of Bagmati river, in Kathmandu, Nepal, April 27, 2015. Thousands of residents take shelter in an evacuation area set up by authorities in Tundhikel park, April 27, 2015 in Kathmandu, Nepal. Nepalese soldiers unload relief goods brought in an Indian air force helicopter for victims of Saturday's earthquake at Trishuli Bazar in Nepal, April 27, 2015. 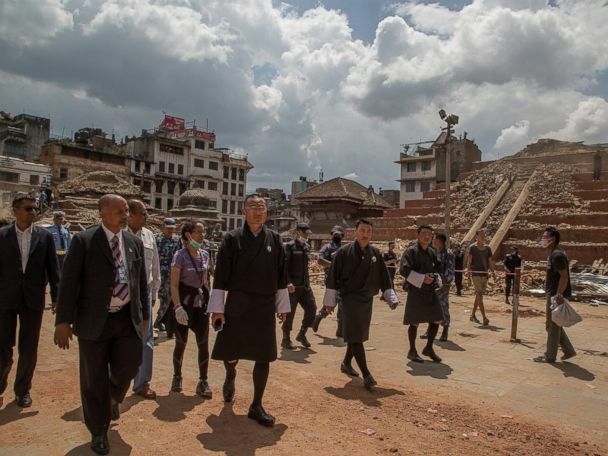 Bhutanese Prime Minister Tshering Tobgay visits the collapsed temples at Basantapur Durbar Square on April 27, 2015 in Kathmandu, Nepal. An Indian woman is assisted by others onto an ambulance after arriving at the airport in Gauhati, India, April 27, 2015. Nepalese soldiers carry a wounded woman to a waiting Indian air force helicopter as they evacuate victims of Saturday's earthquake from Trishuli Bazar to Kathmandu airport in Nepal, April 27, 2015. People line up at a gas station in Kathmandu, Nepal, April 27, 2015. Local people and soldiers inspect debris of destroyed buildings after a powerful earthquake hits Katmandu, Nepal on April 26, 2015. Damaged roads are seen after an earthquake on the outskirts of Kathmandu on April 26, 2015. A pillar where a statue of Garud, a Hindu divine character, stood is partially damaged after Saturday? 's earthquake at the Basantapur Durbar Square in Kathmandu, Nepal, Sunday, April 26, 2015. A Nepalese policeman requests earthquake victims to stand in a queue to receive tents in Kathmandu, Nepal, Sunday, April 26, 2015. Nepalese take shelter in makeshift tents in an open ground from fears of earthquake tremors in Kathmandu, Nepal, Sunday, April 26, 2015. A woman weeps during the cremation of a victim of Saturday's earthquake, at the Pashupatinath temple, on the banks of Bagmati river, in Kathmandu, Nepal, Sunday, April 26, 2015. A Nepalese woman holds the hand of her relative killed in an earthquake at a hospital, in Kathmandu, Nepal, Sunday, April 26, 2015. A man offers prayers to Hindu God Bhairav at Basantapur Durbar Square, a lot of which was damaged in Saturday's earthquake, in Kathmandu, Nepal, Sunday, April 26, 2015. People search for family members trapped inside collapsed houses a day after an earthquake in Bhaktapur, Nepal on April 26, 2015. An elderly Nepalese woman reacts during an aftershock, in Kathmandu, Nepal, Sunday, April 26, 2015. Nepalese rescue team carry on a stretcher the body of a victim recovered from the debris of a building that collapsed after an earthquake in Bhaktapur, near Kathmandu, Nepal, Sunday, April 26, 2015. Family members break down during the cremation of an earthquake victim in&nbsp;Bhaktapur near Kathmandu, Nepal, Sunday, April 26, 2015. Rescue workers remove debris as they search for victims of earthquake in Bhaktapur near Kathmandu, Nepal, Sunday, April 26, 2015. In this photograph taken on April 25, 2015, rescuers carry a sherpa injured by an avalanche that flattened parts of Everest Base Camp. In this photograph taken on April 25, 2015, a cloud of snow and debris triggered by an earthquake flies towards Everest Base Camp, moments ahead of flattening part of the camp in the Himalayas. People try to free a man from the rubble of a destroyed building after an earthquake hit Nepal, in Kathmandu, Nepal, April 25, 2015. Rescuers look for victims under a building that collapsed after an earthquake in Kathmandu, Nepal, Saturday, April 25, 2015. Volunteers help remove debris of a building that collapsed at Durbar Square, after an earthquake in Kathmandu, Nepal, Saturday, April 25, 2015. People walk past a building that was damaged in an earthquake in Kathmandu, Nepal, Saturday, April 25, 2015. Flowers are left by survivors on top of debris from a collapsed building at Basantapur Durbar Square following an earthquake on April 25, 2015 in Kathmandu, Nepal. A young man speaks on the phone in front of a collapsed temple in the city center following an earthquake on April 25, 2015 in Kathmandu, Nepal. 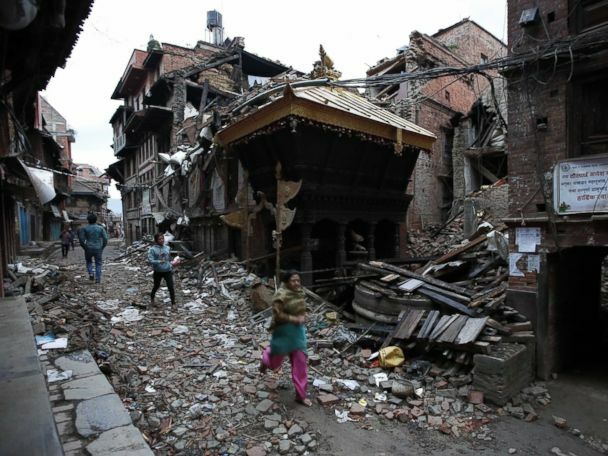 Nepalese people walk past a collapsed bullding in Kathmandu after an earthquake on April 25, 2015. A boy smiles as he is rescued from a collapsed house after a 7.9 magnitude earthquake hit, in Kathmandu, Nepal April 25, 2015. An Indian security personnel stands near a collapsed house after an earthquake in Siliguri, India, April 25, 2015. A Nepalese man and woman hold each other in Kathmandu's Durbar Square, a UNESCO World Heritage Site that was severely damaged by an earthquake on April 25, 2015. People gather near a collapsed house after a major earthquake in Kathmandu, Nepal on April 25, 2015. Emergency rescue workers clear debris in Basantapur Durbar Square while searching for survivors on April 25, 2015 in Kathmandu, Nepal. A man stands in front of a building that collapsed at Durbar Square, after an earthquake in Kathmandu, Nepal, Saturday, April 25, 2015. People sit with their belongings outside a damaged temple in Bashantapur Durbar Square after a major earthquake hit Kathmandu, Nepal on April 25, 2015. Emergency rescue workers carry a victim on a stretcher after Dharara tower collapsed on April 25, 2015 in Kathmandu, Nepal. People clear rubble in Kathmandu's Durbar Square, a UNESCO World Heritage Site that was severely damaged by an earthquake on April 25, 2015. A collapsed building is pictured after an earthquake hit, in Kathmandu, Nepal on April 25, 2015. Nepalese rescue members gather at the collapsed Dharahara Tower in Kathmandu on April 25, 2015. A powerful 7.9 magnitude earthquake struck Nepal, causing massive damage in the capital Kathmandu with strong tremors felt across neighboring countries. A car stands under the weight of an electric pole after it collapsed following an earthquake in Kathmandu, Nepal, Saturday, April 25, 2015. Hundreds of American citizens remain in Nepal, amid fear and frenzy in the earthquake-ravaged country.